disdressed: Whose tent is it, anyway? Whose tent is it, anyway? Thanks, everyone, for your kind wishes for Bebe. She is feeling much better and has been regaling us with long tales of her ordeal, complete with pointing to her "owie" and toward the elevator, with lots of jibber-jabber to accompany her gestures. I've since discovered that it seems to be a common accident, especially in this city filled with elevators. It's been a long week, but I finally have a few acceptable photos to show you. 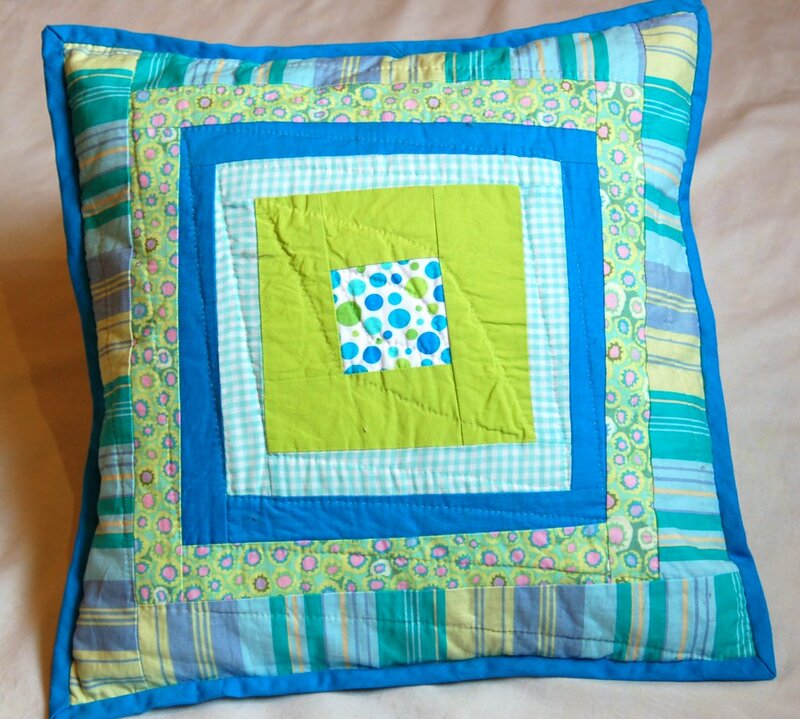 This project has been on my Work in Progress list forever: I had time to hand-quilted the two sides of my patchwork pillow while we were away. I had no idea how relaxing it would be, and it really didn't take much time. 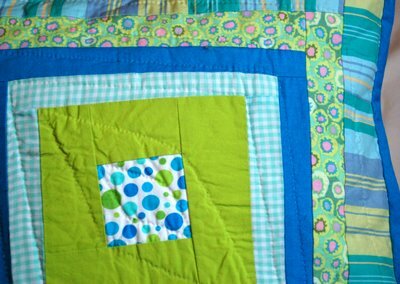 Once I had I completed the two pieces I found myself wishing I had put together a full-sized quilt to stitch. It would have been a perfect project for the lake, especially during the week when Little and I were alone at the cottage and my evenings were so peaceful (and long!). It occured to me, however, that perhaps I enjoyed the process of hand quilting simply because I had the luxury of time when we were away. For all I know I may have enjoyed mending socks, too, just because I wasn't rushed to do laundry or paperwork or check email during our absence. Plus, I had a limited number of projects along, so I wasn't tempted to work on something else with more immediate results. 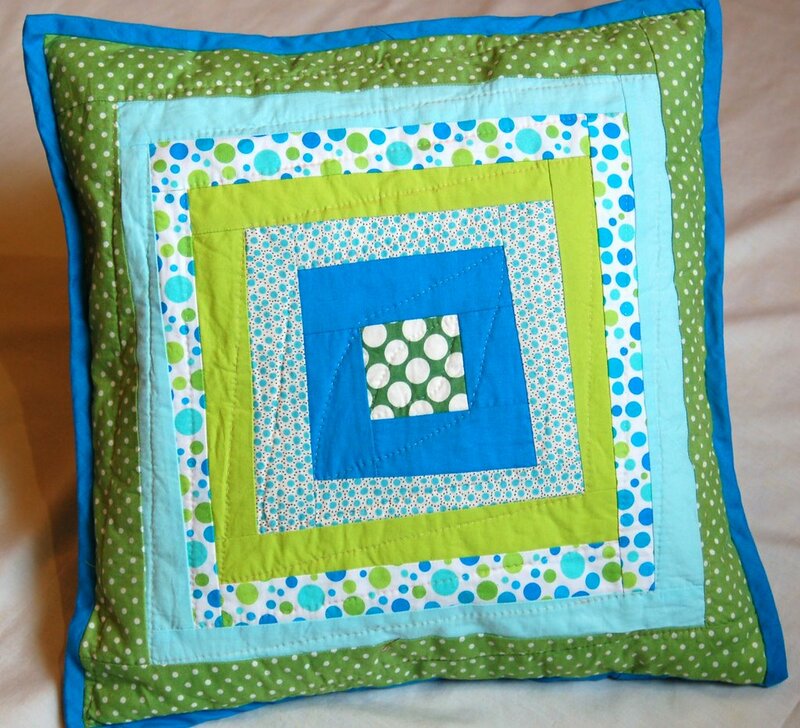 But I think that I will start thinking more seriously about making my first quilt. And since I'm not really crazy about the results of this first patchwork effort, perhaps my first quilt will be a picnic blanket rather than a full bed quilt, just so I can learn from my mistakes and not be too disappointed with the results. I'm not thrilled with the pillow because the fabric selections feel a bit juvenile (waaaay too many polka dots - how did I not notice that earlier?) and the log cabin piecing is not crooked enough for my taste. Nonetheless, we made good use of our pillow as soon as it was completed: it was part of the dining-table-turned-tent we made on Friday afternoon. Little was thrilled that Parker wanted to play house with her. She doesn't realize that it was Parker's house long before Little ever arrived. I'm sure Parker couldn't believe her good luck when I dragged the tablecloth out of storage today, but then she had to share it with a Tail Puller. Drat! 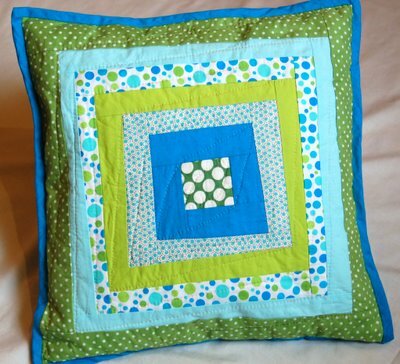 I think you should definitely do a bigger patchwork project - the cushion is lovely. I don't think of the fabric choices as juvenile I see them as fun. Although I prefer the sharper colours on the side in your first picture. Oh, just look at that poor little arm all bandaged up. You pillow looks great! You should definately do a quilt (coming from a person who only makes quilts). 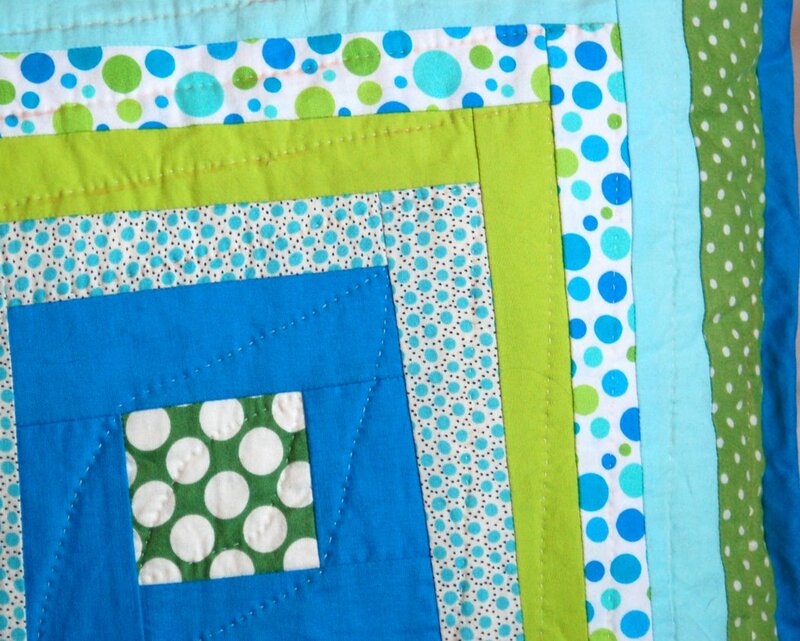 Start small, your picnic blanket is a good idea - just a few blocks to start. :( I don't think your fabrics are juvenile - they look just like something I would choose! The colours are luscious, too. Go on, make a quilt! 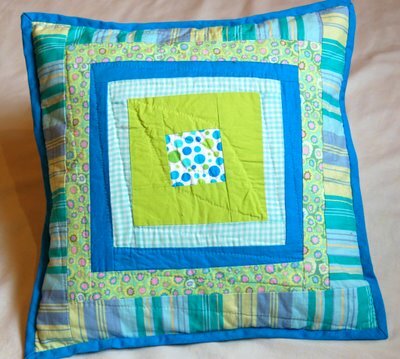 th epillow is great, i adore the graphic element that the diagonal quilting adds without taking away form the log cabin. and how sweet it Little under there with her arm all mending - poor dumpling! hope everyone is feeling better (emotionally as well, it can be so draining). best to you. terrible terrible typos - so sorry! Sorry for the confusion. That thing behind Little that looks like a cast is actually a pillow that she's put her arm behind. I didn't notice that until I saw your comments. She's not wearing a cast, and her hand is almost completely healed now. 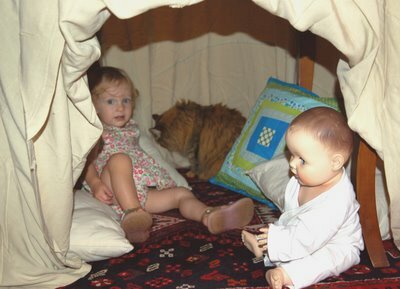 We have a doll just like yours!! that is my daughter's Suzy. She takes her every where (she is 8.) I found ours in a junk store in Maine. I bought her because she was just like my doll when I was little. My mother gave her away and I never got over her! She is the best doll!